Paloma's selection of unique gifts made in the USA under $20, these charming glass pottery jewels serve fabulously as gift ideas through the various seasons & occasions. A gift from Paloma Pottery makes a statement about ethical business practices, handmade craftsmanship, and excellent taste - a great source for gifts made in the USA all under $20. We choose all recycled packaging from sustainable companies and have come to excel in the customer service realm, as an online presence since 2001 - our customers' satisfaction is a clear testimony. 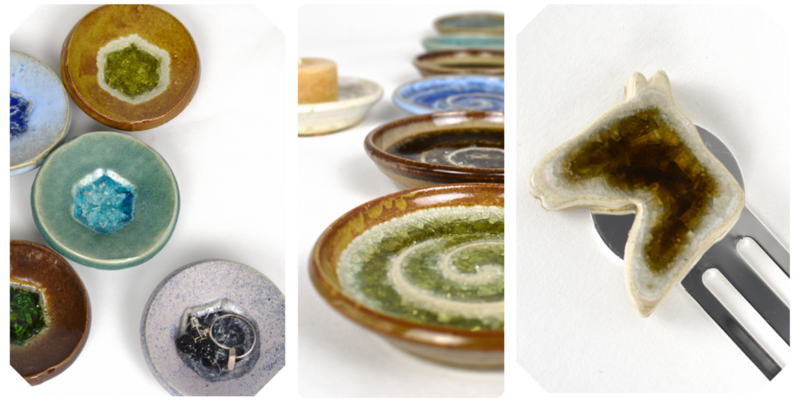 Born of the desire to combine the healing aspect of touch in clay with a strong ecological consciousness. The marriage of personal passion and strong ethics has yielded some glorious results. Beyond that, all gifts are available in custom colors from our Earth - Ocean - Blanco series. This means decor themes can easily be complemented by a piece of sparkling beauty to last a lifetime.